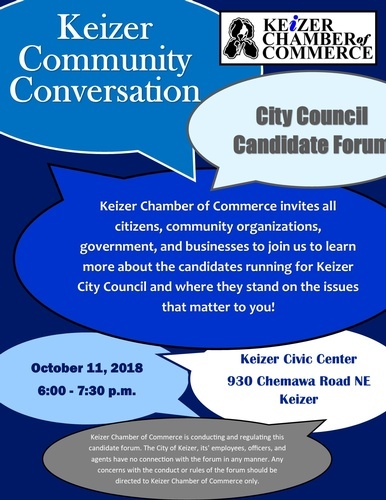 Keizer Chamber of Commerce invites all citizens, community organizations, government, and businesses to join us to learn more about the candidates running for Keizer City Council and where they stand on the issues that matter to you! Keizer Chamber of Commerce is conducting and regulating this candidate forum. The City of Keizer, its' employees, officers, and agents have no connection with the forum in any manner. Any concerns with the conduct or rules of the forum should be directed to Keizer Chamber of Commerce only.